In 1948, a British pilot serving in Iraq acquired a clay tablet with an intriguing, 3,700 year-old inscription. The ancient writing tells the story of how the god Enki warns a Sumerian king named Atra-Hasis of a future flood that will destroy mankind; Enki gives him instructions for building a boat to save his family and livestock. 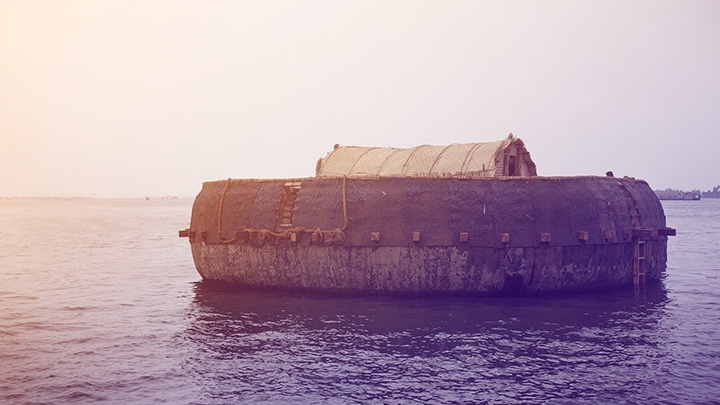 If that sounds like a familiar tale, it’s because this was one of several ancient flood traditions that, centuries later, would inspire the biblical story of Noah. But the tablet’s inscription describes a boat very different from the traditional image of the Ark—it’s said to be circular and made of reeds. Is this nothing more than a fanciful myth? Or could such a reed boat have carried Atra-Hasis’ family of more than one hundred and his many animals? Join NOVA as a team of historians and expert boat builders investigates this fascinating flood legend and sets out to rebuild a tantalizing, ancient forerunner of the Ark. Watch NOVA: Secrets of Noah's Ark April 17 at 9:00 p.m. on WCVE/WHTJ/WVPT. Check listings for additional air-times.